Starling, Revolut, Pockit and Curve were all hit by outages over Friday (29 June) and the weekend of 30 June and 1 July. It was the usual scenario of payments being rejected and customers getting confused. It is understood the problems were caused by the company the firms outsource processing to. This is understood to be Global Processing Services (GPS), which provides similar services to many fintech players and challenger banks, including Fire, U Account and Loot. On Loot’s, U Account’s and Fire’s Twitter feeds and websites, there was no mention of any issues. 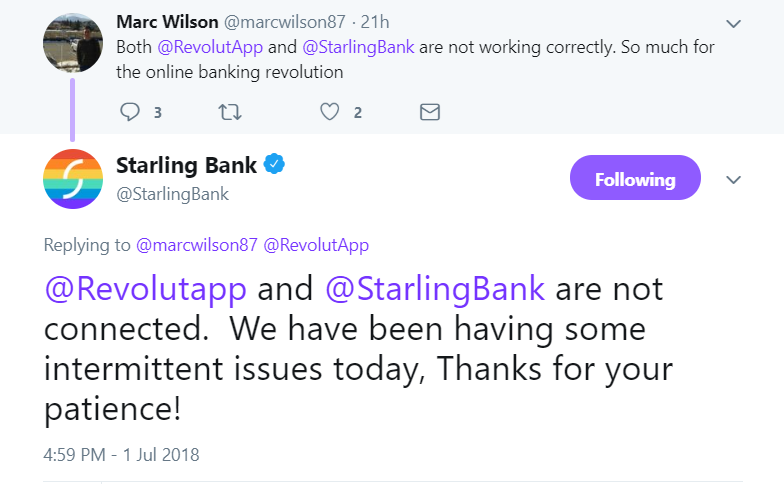 Starling responded to a sarcastic comment (not from us) on Twitter about this outage and the “open banking revolution”. Back in November 2017, and due to similar problems, Revolut said it was building its own in-house processor, following a string of outages caused by its current third-party provider. On 1 July, Nik Storonsky, Revolut’s founder and CEO, wrote an apology due to the latest events. “About ten months ago, I had to write a similar letter apologising for card payments being declined for a substantial amount of time, and yet here we are again. He says the issue was due to a third-party payment processor. The processor experienced “severe latency” when processing data from merchants, which caused card payments to time out and then ultimately fail. This happens when data is not pulled fast enough from a merchant. Storonsky explains that its own in-house payment processor is “on track” to deliver this project by the end of the year and proceed to roll it out across Europe. Last year, it said it would be ready by early 2018.